On the face of it, to present a programme with three pieces that range over one hundred and fifty years might seem a strange thing to do. This is especially the case as they are only linked through the solo instrument, the harp, and are stylistically miles apart. However, in the hands of Anaïs Gaudemard this works well, showing the versatility as well as the virtuosity of the young harpist. The disc opens with the Alberto Ginastera Harp Concerto, a work which was composed in 1956 and will delight any admirers of Argentinean music. This is a piece with all the flair and Latin American spirit we have become accustomed to — a rhythmic tour de force. Dance rhythms abound, with the harp playing a pseudo percussive role. As the notes say, "… he writes in a non-conventional fashion, tackling the harp as a percussion instrument." It is a work in three movements. These are set in the usual fast-slow-fast concerto tradition, although the first movement ends with a very slow and quite moving section. Each of the three movements presents music which is pure Ginastera. Even the slow central movement, with its plucked harp above the typical melodic string sound, can be by no other composer. This is followed by the Debussy, whose Deux danses pour harpe et orchestre à cordes are the only pieces that I knew before I heard this disc. They were composed in 1904 in response to a commission from Pleyel, who wanted a work for a competition at the Brussels Conservatoire. The conservatoire taught the chromatic harp, a newly devised instrument that the Pleyel company had helped to develop and make. Debussy duly obliged, although his two dances soon became a standard work performed upon the conventional harp, as here. Both the dances could be said to point to Erik Satie, with the Danse sacrée especially recalling the spirit of the Gymnopédies. The Danse profane is the more virtuosic of the two. The final work is François-Adrien Boieldieu’s C major Harp Concerto of 1800. Boieldieu's reputation is now mainly as a composer of opera, something which led to him being known as “the French Mozart”. It is through this that I came to know him, I have a couple of discs of areas where he is represented, but I also have an old Accord release, long deleted, of one of his undoubted masterpieces, Le Dame Blanche. He is known to have also written for the harp. There is at least one sonata as well as the present Concerto, which is listed in the Australian Broadcasting Company’s list of all-time top 100 pieces of French classical music (No. 71). Although Boieldieu straddles both the classical and romantic periods, his concerto is deeply rooted in the French music of the eighteenth century with the solo instrument balanced against the orchestra. Anaïs Gaudemard proves herself more than adept at all the various styles of playing and is more than equal to the demands made by these so very different works. She meets each of the challenges head-on and overcomes them with ease; her tone is beautiful throughout and is in perfect balance with the orchestra. She is certainly an instrumentalist to take note of for the future. 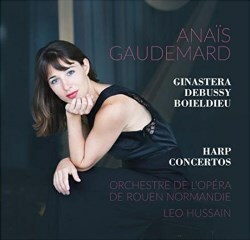 The Orchestre de L’Opéra de Rouen Normandie proves an ideal partner for Gaudemard, especially under the baton of Leo Hussain. The role in this recording cannot be overlooked and the orchestra's playing is stylish and well honed in each of the works. The recording itself is well done, the engineers having pitched the balance between the soloist and orchestra perfectly, something that is not easy to do with a harp. The notes, whilst brief are informative and interesting.